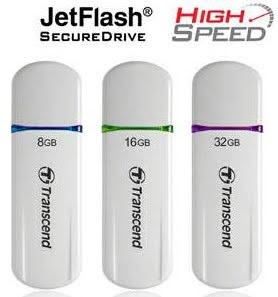 Transcend brings the new JetFlash 620 which is more secure and is faster at speed up to 32MB/s with the help of advanced dual channel technology. The advanced dual channel technology ensures faster speed up to 32MB/s. The built-in 256-bit Advanced Encryption Standard (AES) security safeguards all your documents and other files against illegal admittance. The SecureDrive software aids in creating a confidential secure zone where one can place the secret files which can be accessed by the user only. The password put to access the secret files will enable only the password owner to have access and none other.One can have an advantage to resize the Private Zone and frequently change the password. Transcend JetFlash USB flash drive weighs 8.5gms and measures 60.9mm × 19.3mm × 8.5mm. It features USB 2.o Interface and is CE, FCC, BSMI certified. Moreover, it comes in various storage capacities. One can buy JetFlash 620 8GB USB flash drive at a price of Rs. 960, 16GB costs Rs. 1850 and 32GB can be picked up for Rs. 3625. Tags: Transcend JetFlash 620, Transcend JetFlash 620 review, Transcend JetFlash 620 features, Transcend JetFlash 620 details, Transcend JetFlash 620 specifications, Transcend JetFlash 620 information, Transcend JetFlash 620 images, Transcend JetFlash 620 pics, Transcend JetFlash 620 pictures, , Transcend JetFlash 620 software features, Transcend JetFlash 620 application features, Transcend JetFlash 620 availability, Transcend JetFlash 620 price.